As much as children are wonderful creatures who help to give our lives a deeper meaning, all parents are somewhat stuck for their own time. Children are a blessing, and when they are young, they require all of our attention. Trying to coordinate spending time on ourselves with spending time with our children is often difficult when you throw in the time you have to spend time focusing on other things like work, family, doing household chores and the list goes on. By the time you’ve done all of that, finding the energy to go to the gym? That’s the hard part. No one wants to drag themselves out of the house to the gym when they’ve been exhausted by the basics of the day, but health is essential, and without exercise, you become sluggish, you feel gross, and your body starts to become tired. Most parents are in the throes of sleep deprivation with a newborn baby and don’t feel inclined to exercise at all, never mind at the gym, but gaining back that motivation to avoid being a sedentary parent takes some creativity. Just because there are children around, doesn’t mean that you cannot get out and enjoy some exercise. There are plenty of ways that you can work out as a parent; you have to muster up the motivation to do it when all you want to do is sink into the couch. What If You Want To Get Fit? 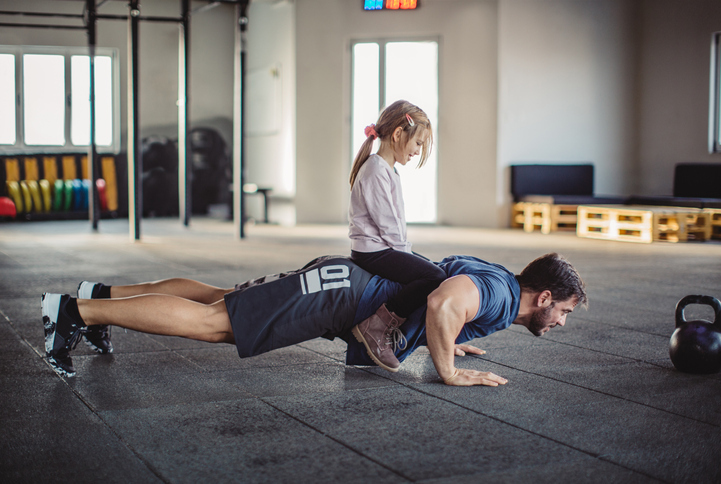 If you’re one of the lucky parents out there that still have the desire to get fit and healthy despite how busy your life already is – well done, that motivation is insane and should be commended. The problem is still getting out to the gym, but you don’t have to worry. There are plenty of ways that you can enjoy exercise without even having to leave the house, and there is one particular way that you can do this, and this is with a home gym. All you need to do is start with a little research into the best workout equipment for home gym use. All you need is a corner of your home, a small room or even the garage as a place to put your home gym equipment, and you can be on your way to being fit and healthy. It’s important to get the right advice for a home gym so that you can workout safely and securely. Not only can you comfortably fit your exercise with the kids in the house or at school, but you can also build it in around your current lifestyle with work and household chores. You don’t have to be stuck worrying about pricing, either, because our home gym fitouts in Melbourne are tailored to your budget. Being able to put the kids to bed, tuck the baby in and sort the house out before cranking up some music on your iPod and working out as much as you want is a great way to multitask as a parent. You get the chance to continue to feel good about yourself while your kids are safe, and you’ve managed to save a lot of money. No more parking charges at the gym. No more time constraints about when you can and cannot go. You could choose to invest in large gym equipment, floor equipment, weights; the choice is really up to you, and you could go the extra mile by fitting a television into the gym to follow online workouts that will match the equipment that you have already. Being in the position to work out at home in the same way that you would in the gym is a privilege, and if you have the chance to do it, you should. There are plenty of people out there who enjoy a good workout without equipment, but if you have the opportunity to continue to use weight bars, the treadmill and all the other equipment that you enjoyed using in the gym, why wouldn’t you? A home gym is a solution to all of your exercise issues as a parent. You’ll be able to go for walks as a parent with the children, but sometimes you want time to focus on yourself, by yourself. And there is nothing wrong with doing that. Ramp up that motivation and start shopping: you’ve got a home gym to fit into your home, and with The Fitness Shop, that’s precisely what you can do.